MTN Nigeria took to their social media handles to introduce the arrival of 17-Digit recharge card PIN in Nigeria; the digits has been increased from the normal 16 digits. MTN is Nigeria's biggest telecommunication network with more than 50 million users. It began with 0803 prefix before including in excess of 6 more number prefixes to suit new users. Additionally, recall in 2016 to be exact, the Telecom recharge card digit number was only 12-digit, which was then expanded to 16-digit and now 17-digit. IS THE FORMER 16-DIGIT PIN STILL USABLE? Obviously, the old 16-digit vouchers is as yet usable and legitimate in any event for the time being. 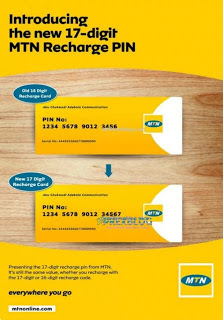 MTN users will keep utilizing the old PIN until the point when this new PIN totally takes over.